Will TSA Ever Max Out on the Touchy-Feely Security Measures? Just in time for the holidays—the only time many Americans fly—the Washington Post reports on the Transportation Security Administration's new passenger pat-downs, which involve touching and feeling around people's private areas. What more could they do to us? According to the Post, the new pat-down policy comes in the wake of terrorists' uncovered package bomb plot to blow up planes over Canada. Again: that incident involved package bombs, and no pat-down would have prevented it. But what the hell—we gotta do something new, right? This is about TERRORISM, so all bets about personal boundaries are off. The TSA says the new procedures "make good security sense." But an increasing number of people are saying they've had it. A National Opt-Out Day, planned for Thanksgiving Eve, is encouraging travelers to speak out against the invasive new security measures. "You should never have to explain to your children, "Remember that no stranger can touch or see your private area, unless it's a government employee, then it's OK," says the campaign's website. Another effort, We Won't Fly, gives people advice on how to opt out, including telling people not to fly at all. This might not be practical—many people can't spend a few days driving across the country to see relatives, which only adds to the frustration—but it could be useful for getting airlines more on board. We Won't Fly is also collecting stories from travelers who try to opt-out of the searches. 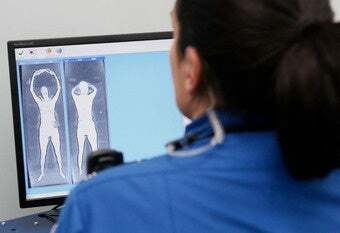 Their language seems a bit over-the-top—"TSA Fondles Women and Children Refusing Airport Naked Body Scanners," says the title of one post—but is it? Fondling women and children is what's going on here, all links to videos by conspiracy theorist Alex Jones aside. Even pilots are calling the measures "out of control" and "blatantly unacceptable." It does seem nuts that people should be treated as common criminals and subject to personal boundary violations just because they want to go somewhere—especially when such measures might not even be effective against terrorism, as some security experts say. So far, we've tolerated these intrusions on our personal space, but maybe this latest round of security measures is where we draw the line. Seems that somebody has to, sooner or later.